-The big news coming up soon is the Homefront worldwide campaign. 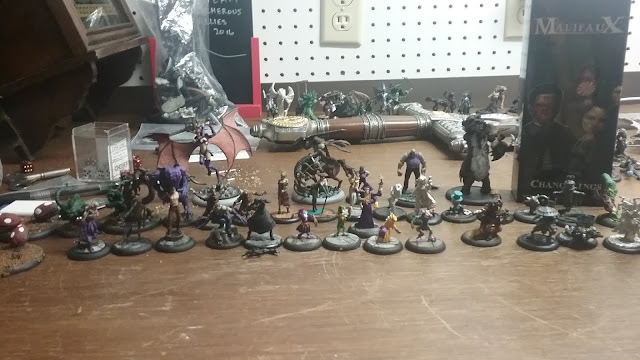 Tying in the story of Malifaux with The Other Side, players will compete in games of Malifaux to help establish a new Syndicate, a small faction that can be hired by the main factions in TOS. One is the Council, built from the remainders of the cabal of wizards that opened the first Breach. The second is the Sandmen, who are effectively being driven by the Tyrant Nytemare. And, finally, there's the Order of the Chimera, an Egyptian syndicate led by Marcus. Players will report games on Wyrd's Website, with wins supporting one of the new syndicates as well as the Malifaux faction you used. More on this in later posts. -If you're going to Pax Unplugged, Wyrd needs volunteers. -Through the Breach core rules launched on DriveThruRPG, and Wyrd is running a raffle for anyone who buys it and puts in a review by the end of October. If you win, you get the entire Through the Breach catalog available on DriveThruRPG. So, I'll briefly look at what hobby work I have in front of me for the Collodi crew I'm constructing. Per most of my crews, there's going to be a mix of metal and plastic here. I don't like rebuying models I already own, so this is unlikely to change anytime soon. I drug out what models I have that I think would be useful, and took a picture. -Arcane Effigy-Needs to be remounted to a base, requiring drilling and pinning. Also, could use some painting. 3x Changelings-Need assembly and paint. If I'm going to tournaments, probably best to avoid proxies if I can. 3x Wicked Dolls Need paint and assembly. At some point, Lazarus would be a good addition to this bunch, as he and Collodi have fun together. Also, I need to find some proxies for Hinamatsu and Bultungins. Hrmm. I have a lot of work to do. If there's anything obvious that I need to add, let me know. Next week, I'll be doing a book review of Broken Promises, the new Wyrd book (because I haven't written enough about it, apparently.) After that will be a tactics article featuring the master everybody loves to hate, Pandora. And why am I writing about Pandora? Because I was commissioned by one of my Patreon supporters to do so, that's why! Speaking of Patreon! This is the last post before the end of the month raffle for a Miss Ery, an alternate model for Teddy. Anyone whose pledged $1 or more a month gains entry to the raffle, and right now you've got an excellent chance of winning. Plus, it's a way to help this blog grow and prosper and can open up new opportunities for Malifaux Musings content. So head over to our Patreon page and sign up!